Wireless Range: Up to 40’+ ft.
Speaker Connection Cable, 16’ ft. Single Speaker Weight: 5.73 lbs. The Pyle Home Bluetooth Speaker System provides in-wall / in-ceiling mounting convenience. Deliver effortless stereo sound to any room in your home or office with wireless music streaming ability. Activate Bluetooth audio via the integrated function switch and enjoy the ability to stream your sound from all of today’s latest Bluetooth devices (like smartphones, tablets, laptops and computers). System includes one active speaker, one passive speaker, speaker connection cable, built-in digital sound amplifiers, along with an external power supply adapter. Mount the speakers in a convenient location on flat wall or ceiling panels for a flush, clean look. 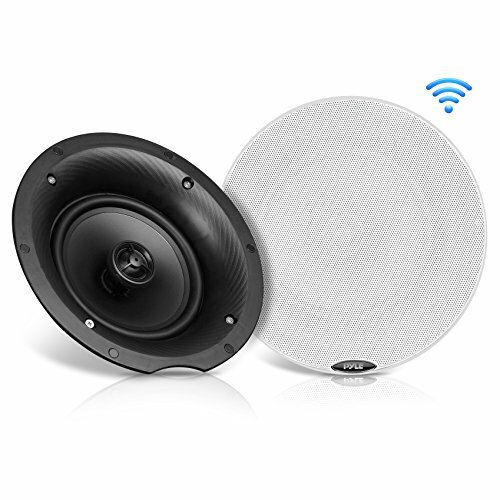 Achieve wide-range sound performance and add audio to any room with the Pyle In-Wall / In-Ceiling Bluetooth Speaker Kit. SPEAKER GRILL - Includes built in round stain resistant speaker grills. Match existing flush mounted designs in your home or workplace for a clean look & achieve wide-range sound performance without compromise. SEAMLESS INTEGRATION - Perfect sound wherever you need it. Great for existing home theater systems and custom applications this Pyle 2-way in-ceiling or in-wall speaker system will deliver on-demand crisp audio sound clarity all the time. FLUSH MOUNT DESIGN - Compact flush mount design for simple easy installation in-wall / in-ceiling , or pre-cut speaker openings, for in home use, office, professional, or custom audio applications on any flat surface. EASY TO INSTALL - Includes a cut-out size template screw terminal block speaker connectors with ability to DAISY-CHAIN SPEAKERS for simple, easy, no hassle installation with included speaker connection wire, bluetooth Controller & power supply.